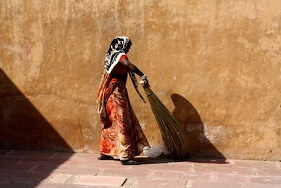 Nirmal Bharat or Swachh Bharat – Is India getting anywhere close to becoming open defecation free? Providing complete toilet coverage across the villages, towns and cities of India has acquired extreme significance in policy discourse, if one were to go by the scale of the two missions: Swacch Bharat Abhiyan and Nirmal Bharat Abhiyan. The BLS 2012 reported that 11.11 crore or 62% of the 18.2 crore rural households don’t have access to toilet facility within their premises. Today, 3 years have passed since the launch of these two campaign by successive governments and only 1.69 crore toilets have been built and approved (till July 2015), which implies that only 15% of the required number of toilets have been approved. Also, only 40% of the total households have improved toilet facilities. Toilets have also been constructed in schools and Anganwadi complexes and a total of 1.41 lakh school toilets have been built and 3 states, WB, Rajasthan and Bihar also account for approximately 60% of the total toilets built in schools. The maximum number of toilets built since April 2012 have been in West Bengal, which accounts for more than 14% of the total toilets built in this period. 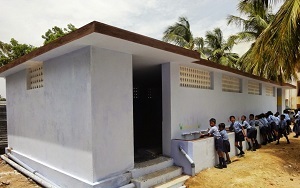 MP, Karnataka, UP, Rajasthan and Maharashtra together account for 45% of the toilets built.